Which side goes out? i.e. which side would you have showing when the quilt is complete? The side that goes all weird the first time you wash/dry it, or the "woven" side? I just loaded it on my frame and I'm looking at it thinking it feels wrong, but I really don't want to frog it apart after the fact if I second guess and load it wrong the second time. LOL! I have the woven side to the outside at the moment. I was told that it really doesn't matter by a woman who has worked in the same fabric store for 30 years. She told me that most people aren't comfortable with that so she should me a little trick. You gasp the selvedge edge with both hands about 5-6 in apart and pull. The edge will roll up one way or the other. The side that the selvedge rolls to is the "so called" wrong side. If it was me I'd rather have the softer side next to my skin. Are you talking about sweatshirt fleece or poly fleece? Sweat shirt fleece would be the smooth side out not the ugly side. The others don't have too much of a difference unless it is a print. it sounds as if you are using a one sided fleece?? ?where one side is soft & one side is a 'backing'....the backing side should be toward the batting- the soft side out---the whole reason for using fleece is to have a soft/cozy side next to your skin to cuddle with. With some fleece, it's hard to tell the front from the back. One side will look a little bit more furry, and it's usually a little softer. I like to use that side as the backing because it's cozier, but I have messed up and got it backward and the blanket still turns out fine. Sorry everyone, I should have specified. I don't know a lot about fleece, but this is the second quilt I'm making with it. The first one appears from the descriptions above to be polar fleece, the same on both sides, I chose the side making sure the pattern was right side up. This one is more like the sweatshirt fleece. There's the side we usually see outside, and the side that feels great til you wash it. The way I have it loaded right now is with the smooth side out, when it pills up and starts to feel weird, it will be inside and no one will be able to tell. I see the comments about having the other side out because it's more cuddly, and I think that's why I was second guessing myself... does it really not matter? I think with sweatshirt material, the side that feels great until you wash it should be on the inside, smooth side out. I think the cuddly factor would be outweighed by the pilling factor. I was surprised that the fleece in the Monsters U fleece throw kit was single sided fleece. One side is all soft and fuzzy and the other side looks like the back of faux suede - like a knit. On that one it is obvious that the fluffy side is the outside. I'm inclined to leave it smooth side showing, for exactly the reason that willferg mentions. And the lint would be unreal once it starts to pill up. Certainly not my first choice of backings, but I just quilt them I don't pick the matches. my husband has a sweatshirt that was made (on purpose) with the fuzzy side on the outside. I cannot tell that is made any difference. I just try to fold it inside out everytime I wash it! They actually printed on the fuzzy. 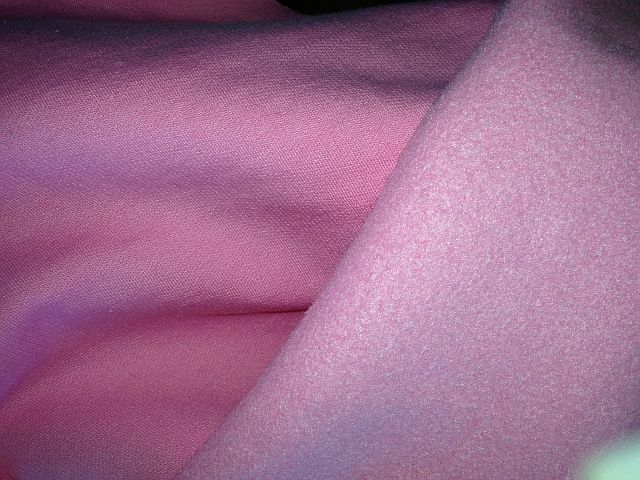 This pink is sweatshirt fleece, I would put smooth side out, not the fuzzy side. They actually printed on the fuzzy. And it sticks? I would have thought embroidery might stay, but anything else surprises me. I have what I think is a polar fleece pull over with embroidery on it. I liked it better before I washed it. Now I use it mostly for camping.